People who argue against God are only able to do so because God exists. Last week, we talked about how if God does not exist, morality does not exist. There's no such thing as a moral obligation or a moral value or duty if God does not exist. Moral laws require a moral law-giver. At the same time, we also pointed out that a person can deny the existence of God and still do moral actions. Now, there wouldn't be such thing as a moral action if God didn't exist, but you can deny that God exists and still do moral actions. You could foreseeably, for instance, deny that authors exist but still read books. Where did the books come from? Who knows! You could still learn to read and read a book and deny the existence of authors. It's a bad position. It's inconsistent, but none the less, you could do it. I want to talk about a broader instance of this type of problem today. I want to talk about how the person who argues against the existence of God or even says, "God does not exist," is only able to do that because God exists. Let's flesh that out together today. The first thing to point out is we're not going to look at this situation the same way as a non-christian. We should not make ourselves look at this situation, look at the evidence as a non-christian would. Now, it's helpful to understand where they're coming from, but when we want to look at the situation as Christians, we know much more than the non-christian does. We have been given God's word which tells us about so many things we could not know otherwise. This is one of them. We know from scripture that we were created to glorify God. Our bodies were created not to live for ourselves but to glorify him. Isn't it interesting that the person who is denying this existence of God is actually behaving contrary to how they were designed to be? They can only make that denial because of how God created them to be. He created us to have an intellectual sense. He created us to be able to make choices, different from animals do in that way. We're able to evaluate evidence and come to a well-reasoned conclusion and make a choice about what we're going to do. He created us with those faculties to use them for his glory, not our own. Isn't it interesting that the non-christian takes this gift, takes, in fact, how we were designed to act and flips it upside down, so instead of using it to glorify the creator, he uses it to glorify the creature, himself. He's only able to do that because of how God created him. He takes the gift that God has given him, of all these attributes that come from being created in the image of God and uses them for an ignoble purpose, not a noble purpose. That's the first example. Our very selves were created to glorify God, and yet, we often don't do that. We flip it upside down, and we use it to glorify ourselves, not God. The second thing that is true when a non-christian or atheist argues against the existence of God is they're doing it in God's universe. They wouldn't even be here if God hadn't created them. The very fact that they're able to argue against the existence of God is only because God has created them in this world. They're standing on God's ground, in God's solar system, in God's universe, breathing God's air and arguing against him with their very God-given breath. That is just so ironic, I think. It also points out the fact that so much of who we are as people, apart from the regenerative work of Christ has been corrupted by sin. People often say, "Why isn't God more obvious?" Well, are you going to answer that as a Christian from a biblical point of view, or are you going to answer it from a non-christian point of view? Biblically speaking, God is incredibly obvious. Romans 1 says that He has used the natural world to make known his power and divine glory, that we can know he exists from creation. The psalmist says in Psalm 19:1, "The heavens declare the glory of God. The sky displays his handiwork. Day after day, they pour forth speech.” The skies are speaking who God is and that he exists. Now, we can't know everything about him through nature which is why we have scripture, but nonetheless, scripture tells us from God's point of view, which is the only true point of view, that nature tells us that he exists, and yet what do people do? They use nature to argue against God. Maybe it's by breathing his air, standing on his ground and arguing against him with their very God-given breath as we pointed out, or maybe it's by saying, "Well, look. We see these natural processes that God has created where animals can adapt to their environment." Then, maybe we extrapolate that out and say, "Well, that means that everything could have come from a single-celled organism. You know what? God's not necessary.’ We take what God has displayed in nature that actually displays his creative handiwork. Some people take it to an extreme and then argue against him based on his own creative handiwork and a theory that lacks much evidence. Nonetheless, isn't that interesting? We don't just use ourselves. We use God's world to argue against him. We'll say, "Well, we know how it works. There are these physical laws, so God's not necessary." That's the exact same argument we saw last week with morality. Just because you know that something works or even how it works, that doesn't tell you where it came from or why it's here. We could say, "Well, there are these physical laws," (which actually aren't laws. They're just descriptions of how things usually work if all things are the same) and we understand this, so God's not necessary," but that's not true, right? Where did the law come? Laws require law-givers? Where did all this stuff come from? Once again, did everything come from nothing for no reason with no cause for no purpose? That makes no sense. We don't just use our bodies and our minds. We use the physical world, often times, to argue against God. Once again, they can only do that because God exists, because he created them, and he created this world. Just to briefly hit on what we hit on last week, a third way that people often argue against God, and they're only able to do that because he exists, is with regards to our moral intuitions. Everyone has moral intuitions. Everyone knows deeply that certain things are right and certain things are wrong. Now, they might relativize that and say, "Well, that's just my opinion," or "That's just because of society," but we've talked about these types of things in the past and how those arguments and those reasons ultimately lack explanatory power. They are not good explanations. They're the best you've got if you deny the existence of God, but nonetheless, when you look at them circumspectly from all angles, they're not the best explanations. As Christians, we know they're not true because God is the basis for morality. God has created people with moral knowledge because they're made in his image and as he says in Romans 2, the law is written on their hearts. How do they use that to argue against them? Well, in a few ways. One is what we looked at last week, that people will say, "Well, I don't need God to be moral." Well, in a very philosophical sense, if God did not exist, you could not be moral, because there's no such thing as morality. That's what we hit on last week. However, people often take this a step further. They'll look at the acts of Israel and God and the Bible. For instance, God declaring and decreeing the destruction of the Canaanites. They'll see, "That was immoral.” So they're using the moral sense God has given them to analyze God's actions, and then say, "He is immoral." That is the height of rebellion and autonomy. That's flipping upside down the creator-creature distinction. It's thinking that God, somehow, for some reason, must play on the same field with the same rules that we do. That is not true. What the creator can do justly and rightly is not necessarily, and we shouldn't expect it to be the same as what the creation/creature should be able to do. People take this moral impulse, this moral intuition they have and say, "I can be good without God.” They also analyze God's actions and say, "He was immoral." It's not just that they complain and degrade what God did in the Old Testament with decreeing the destruction of the Canaanites and things like that. No, they take it a step further sometimes and will say that, "if Christians are right, that there is a God who sent his son to die on the cross, that that is cosmic child abuse. What type of loving perfect good God sacrifices his own son, sent his son to die?" Well, you know what? In part, this is based on a feature of them being created in the image of God. They have a moral impulse. That's good. We need to work with that when people show it to us, but a result of the fall is that our intellect, our mind, our impulses, our desires, our feelings and indeed, even our moral intuitions are corrupted. They've been tainted. They don't allow us to see correctly. They don't inform us well about the world. On the one hand, a father who kills his son, if that's all you know, yes, you'd probably be inclined to say, "That's not good," but that's not all we know. That's not all Christians say about the cross. What they do say is so much more than that. Don't we say that the son who came was also God, that God came himself, that he didn't just conscript someone else to be the scapegoat, but he himself came to earth to die on that cross for our sin? What they see when they complain about God coming and sending his son to die on the cross is they don't understand the Trinitarian aspect of it. More than that, they miss the fact that it's God doing it himself, but even more than that, that this is love. This is what the bible tells us, that we know love because of what happened at the cross. There are at least 10 to 15 places in the New Testament where the display of God's love is linked to what he did at the cross. Isn't this just the height of irony? The greatest irony of all the things we've looked at today is that this non-christian, this hypothetical person is arguing against God. They're saying he is immoral. He is unjust. They're criticizing and condemning him for the very act of the cross which he did to pay for their immorality, their rebellion which at that very moment, they are exhibiting. That is the height of irony. It's the height of depravity also. It exhibits man's autonomy and what happens when man lives apart from the law of God. These are just a few examples. We could keep going. What we've looked at today is that we use ourselves. We use our body and our mind that—we only have because God created us—to argue against him. We argue against God from the physical world, often times. We also looked at the fact that the non-christian will use his moral intuition that God gave him and argue that God's own actions are immoral. More than that, it goes a step further when we look at the cross. We see that the non-christian often thinks the cross is immoral. The very means, the only hope they have of salvation, they condemn as immoral. That speaks to the fact that this is not an intellectual issue. We looked at Romans 1 briefly where God says, "Men are without excuse because his existence can be known." We can't take a non-christian or a non-biblical view on this issue of God's existence and say that, "Well, I guess people do have an excuse. I guess it's not clear to everyone." No. God says it's clear, so it's clear, so man is without excuse. If everyone can evaluate the evidence the same way, why don't we come to the same conclusions? Because we can't all evaluate the evidence the same way. We have different presuppositions intellectually, but if you even go down a layer further, if you want to think of it that way, our spiritual state influences how we think. Man has been corrupted because of the fall. He does not think correctly. He thinks of himself more than his creator. He sees his autonomy as the the highest good. Autonomy literally means self-law. Maybe we'll talk about that another week, but nonetheless, all of these things result in him not behaving in a rational way. It is rational to believe in God. It is irrational to deny his existence and say, "He is immoral," for all the reasons we've looked at today. “You want to say that the physical world is an argument against God. Well, where did the physical world come from? You have a big problem there.” Everything from nothing? That's not something I would want to have to defend, but that's what the non-christian who makes such a claim has to defend. Let's push them on that. Let's make it clear that people can't just sit in God's lap in order to slap him in the face, as Cornelius Van Til has famously said. We did a podcast on that before. They're only able to be where they are because of who he has created them to be. They can only slap them in the face (argue against him) because of who he has created them to be. They use the very good gifts he's given them to argue against him. I hope this has been helpful. 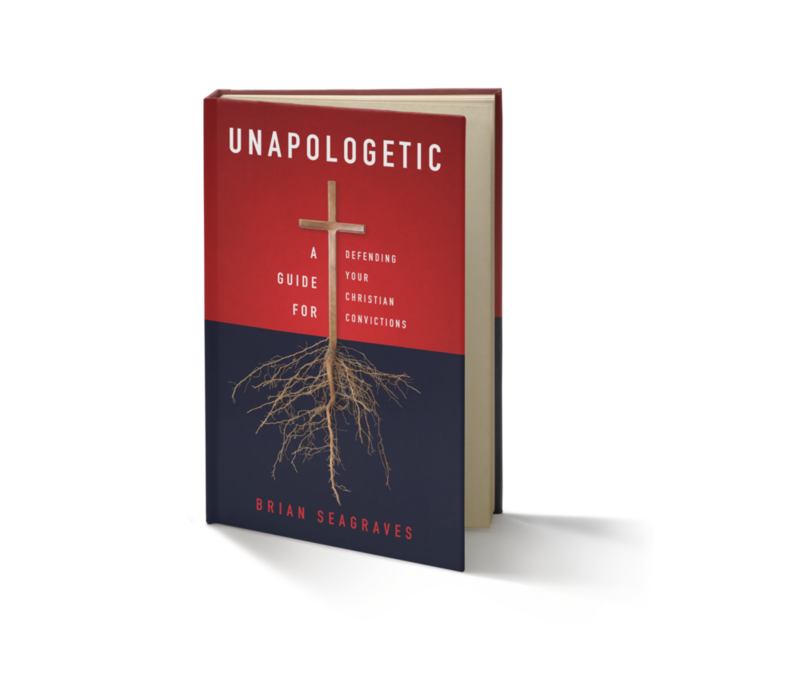 I look forward to talking with you next week on Unapologetic. Older PostEpisode 109 - Do You Know Any Smugglers?